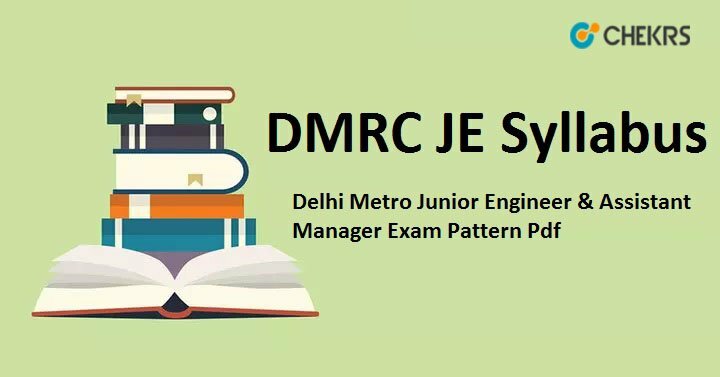 DMRC JE Syllabus 2019: Delhi Metro Rail Corporation is going to conduct Junior Engineer Recruitment examination. Candidates who have applied for the recruitment drive, in order to boost their exam preparation, as well as in order to perform the best keep a note of DMRC JE Syllabus 2019 Pdf and pattern. Complete syllabus details of Mechanical, Electrical, and Non-Executive Electrical and Electronics Jr Engineer exam pattern plus DMRC Junior Engineer Electronics Syllabus 2019 is given below. The Syllabus of Delhi Metro recruitment is consists of five subjects. Candidates who have applied for the examination, the recruitment board will assess candidates skills sets by organizing a two-phase examination for Delhi Metro Junior Engineer Mechanical Syllabus 2019, refer to below section. In the first phase, candidates knowledge will be judged in subjects such as general awareness, general intelligence, quantitative aptitude, and technical subjects, whereas in the second paper candidates English subject familiarity will be judged. Complete syllabus details of DMRC Junior Engineer Civil Exam Syllabus 2019 Pdf and other Junior engineer non-executive posts is elaborated in the below-given table. Delhi Metro Junior engineer recruitment will be organized as per the below-given exam pattern. In the first paper as per DMRC Assistant Manager Exam Pattern 2019, the question will be (MCQ) type, whereas for the second paper only competency level will be checked. To access the exam DMRC Electrical Engineer Exam Pattern clearly refer to the below-provided table. DMRC JE examination paper will be available in English & Hindi language. Students who are preparing for the DMRC recruitment, it is very important that you prepare in accordance with the DMRC JE Syllabus 2019. Since in order to outreach the vast syllabus, we forget the main crux of the syllabus, thus to perform well in the examination it is very important to be precise with the syllabus. In case you need more clarification regarding the same, you may contact us via below provided commenting section.